On September 25, the State Duma opened an exhibition on the history of friendly relations between Russia and Greece. 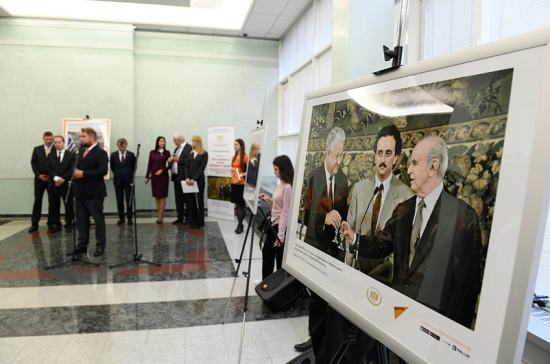 The exposition ”The Way from the Past is a History Turned into the Future“ is timed to the 190th anniversary of the establishment of diplomatic relations between the two states. Deputy Chairwoman of the State Duma Irina Iarovaia noted the importance of this event. She reminded that 190 years of diplomatic relations, 25 years of the signing of the Treaty on Friendship and Cooperation between Russia and Greece are truly historic milestones of the joint path of the two peoples. ”We are connected by great friendly, historical ties. We are connected by sincere trust and friendship, we are connected by very serious and deep legal relations. More than 50 contracts are a reliable foundation that proves that over the years we have not only built trusting relationships, but also value the sphere of security, harmony and trust that prevail in relations between countries and peoples,“ said Irina Iarovaia. The Deputy Chairwoman of the State Duma told that she had recently visited Greece within the framework of the Interparliamentary Assembly on Orthodoxy and had participated in the opening of a similar exhibition in the Parliament of Greece. ”I believe that this is a good sign of trusting relations,“ the parliamentarian said. She stressed that this is the first exhibition which the Parliament of Greece allowed to open within its walls. Irina Iarovaia expressed her confidence that this exhibition will necessarily have a continuation, as well as friendly relations with Greece. Deputy Chairwoman of the Committee on International Affairs Svetlana Zhurova noted the stability of relations between Russia and Greece on the basis of both spiritual and economic values. Ambassador of Greece to Russia Andreas Friganas thanked the State Duma for the exceptional initiative to organize the exhibition. He said that the relationship between the peoples of Russia and Greece has more than a thousand-year history: ”This is primarily a spiritual connection, which is explained in many ways by a practically common alphabet and, of course, by the common religion that unites us. Once, the Russian Empire provided invaluable support in the formation of an independent Greek state“. Sergei Kochetkov, deputy editor-in-chief of the agency Sputnik, thanked the State Duma for having provided such a venue for the exhibition. The exhibition will last until September 28. Earlier, in June-July 2018, it took place in the Greek Parliament in Athens. It is organized by the State Duma Committee on International Affairs and the international project Sputnik which is a part of MIA ”Russia Today“. It shows about fifty images from the media group archives.